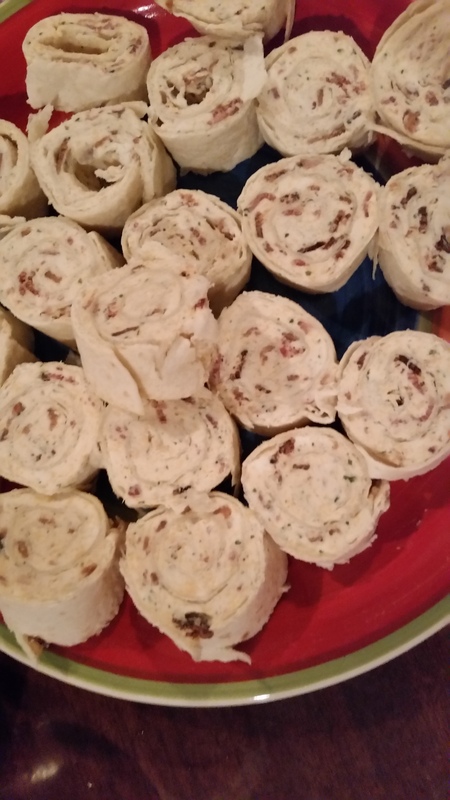 Cheddar, Bacon, Ranch Roll-Ups – What's for Dinner Moms? 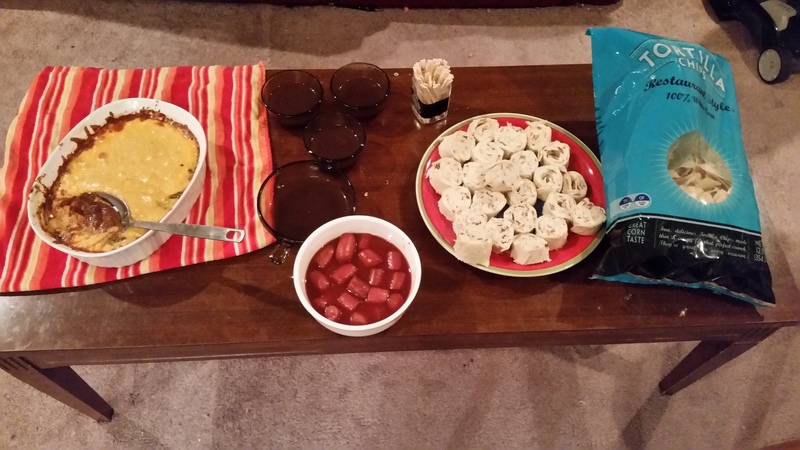 A friend of mine used to have a New Year’s Eve party every year. He would serve something similar to this (frozen and from a box) and would call them “Ritzy Roll-Ups.” We used to laugh every year when he would set them on the table because they were delicious but the name was hysterical. I was looking for a quick appetizer the other night and remembered his Ritzy Roll-Ups. The toughest part of these was cooking the bacon. If you chop up the bacon into little pieces before cooking it will cook faster and be ready to add to your dish in about 15 minutes. These were a simple addition to our appetizer buffet, part of which is shown below. They were so easy to make and I made the filling the night before and let the flavors meld over night before letting it soften to spread on the tortillas the next day. Super easy AND I could make them a day in advance so that I had one thing less to do on the big day! I would suggest if you are salt sensitive to add less ranch mix and taste as you go to get the perfect amount for you and your family. I cut the amount of bacon down for my family because they thought it had too much in them (who complains about too much bacon?). Beat cream cheese in a bowl until smooth. Add cheese, bacon, and ranch dressing mix to cream cheese. Mix together until all are fully blended. Spread mixture on tortillas in an even layer. Roll up tightly from one side to the other. Wrap rolls in plastic wrap and refrigerate for at least 30 minutes to 1 hour. Remove plastic wrap and with a sharp knife cut into 1/2″ to 3/4″ slices. Serve cold on tray. Thank you, yes it is! Easily done and a super idea for events! Thanks! They are super easy. Thank you, Sylvester! Hope you have a great day. You’re welcome, Marci and thank you so very much! Hope I remember this — I’m on for appetizers for a circle party next Tuesday! Thanks! Hope you like them if you make them.